James sent me an article a couple of weeks ago entitled “Navigating The Quarter Life Crisis, or Why Living Out of My Car was the Best Thing I Ever Did”. I think he sent it to me because we’ve both been feeling a general malaise and dissatisfaction with where our lives are currently. After reading the article, I wasn’t quite sure if I was comfortable with the term “quarter life crisis” – a little too severe? – but I found Kate Northrup’s story of starting over intriguing, hugely because starting over is something I’m incredibly afraid of. I’m not a risk taker by nature. I take comfort in procedure, in following instructions, in making plans. For every situation in my life, from the trivial to the important, I have a plan A, B, and C. This is a double-edged sword of a trait, I realize, but it has served me well in certain aspects of my life. lt served me well in becoming a self-sufficient child who solved her own problems. My parents often comment on how even as a child, I didn’t really need any babying, I just got by. It served me well in becoming a high-achiever in high school when I juggled a part-time job, community service, church, various extra-curricular activities, and a heavy academic load. It serves me well now in our relationship – I handle bill-paying, budget-making, meal-planning, and tax form-filing. You know, all the exciting stuff. ;). Where it has not served me well is in being absolutely worthless when plans fail. I don’t mean emergencies where you have to perform CPR or our checkbook is in danger of going in the red or I get a flat tire. Those are contingencies, and I’m good at contingency plans. No, I’m worthless when it comes to hard-thought, well-laid plans just falling apart. My mind has a hard time comprehending how failures happen when you’ve crossed all the ts and dotted all the is and triple checked, because if failures can happen even after all that due diligence, where’s the sense in that? College was a time of spectacular failure. There were good things, too – I met James (!!!) and I did get that diploma (!!) – but it was a lot of…hard. I realized all of my limitations, physically and mentally. I realized the limitations of planning. Not “aha!” realized, but the more physical meaning of that word in that failure became a realized fact that I could no longer evade and plan around. When I graduated in 2011, I just wanted to find order again. I found a job that payed decently. James and I waded into life post-college together, doing as well as we could, ecstatic to be out in the “real world”, ready to make our mark. We prided ourselves in our home, in the life we were building. We were young, we had our health, we had each other. Everything was fine. But as time passed, we started having little inklings of restlessness, little moments of disquiet and dissatisfaction. Little somethings that were akin to what Kate Northrup writes in the article: “Leading up to the decision to take off on the open road, my life was pretty amazing. Yet, little bits of resentments, feelings of dullness, and an itch to make a big change that wasn’t going to be scratched by getting a new haircut had begun to bubble to the surface.” James scratched that itch by looking for a new job, one that would make him feel like he was contributing to the world and making a difference. I scratched that itch by pretending I didn’t feel it. (Me now to me then: Oh, Hes!). I stuck my head in the sand, desperately holding on to the security and order I had just reclaimed for myself. So what if my job was boring? I was good at it, and it was stable, a rare gem in this economy. I said starting over is something I’m incredibly afraid of. And it is. But I’ve learned recently that I’m more afraid of feeling this malaise 2, 3, 5, 10 years from now if I don’t do something. I’m more afraid of being so afraid that I give in before I’ve clawed and crawled with everything I have for something more. 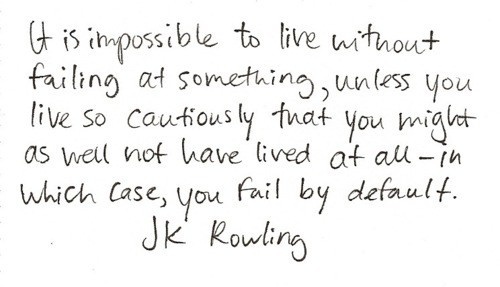 I’m more afraid of failing by default. Starting over can be another spectacular failure; there are no guarantees. But we’ll have dared to jump into the not knowing instead of drowning in it. We’ll have started, which is half the battle.